Students will stay with host families or in on-site dormitory housing. Want to do something meaningful with your Spring Break? Apply for Alternative Spring Break! WHAT IS LITERACY ARTS ALTERNATIVE SPRING BREAK? 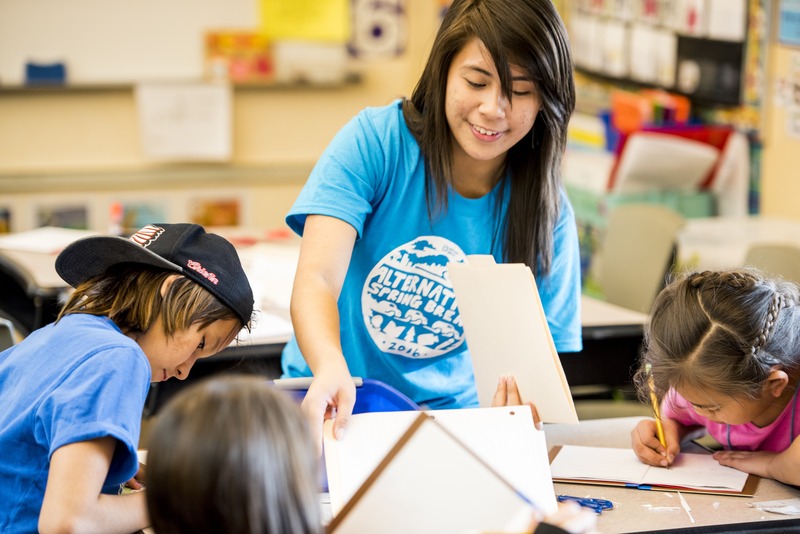 Pipeline recruits a group of UW undergraduates to volunteer on a literacy arts project with elementary, middle or high school kids in rural Washington during spring break. The UW students are sent out in groups of 5 to 8-9 sites to help young students come up with an idea for a book, write a rough draft, edit the draft, and print and bind a single-signature book. The young students illustrate their published book and present it to the community at the end of the week. Each team will collect students’ stories and artwork and bring it back from the project to compile in a magazine to send out to all of the student participants. Selected stories will be featured in the magazine and all of the stories will go on the web. Following the project, the stories need to be edited and the magazine designed. WHAT SITES DO VOLUNTEERS GO TO? Pipeline will be going to 8-9 sites around Washington: Curlew, Oroville, Forks, Harrah, Mattawa, Omak, Tonasket and Long Beach. WHERE DO THE PIPELINE VOLUNTEERS STAY? Each site will provide housing for the volunteers. This varies from home stays to on-site dormitory housing. Pipeline will provide needed materials. Further, all lodging, transportation, and food costs are covered by Pipeline. There is no fee to participate in ASB. However, all participants will be part of creative fundraising efforts to cover some of the costs of the program. Any enrolled UW student can apply. While Alternative Spring Break isn't limited to students who have tutored before, applicants that have tutoring experience are preferred. Applicants who are chosen will attend two mandatory training sessions and two hands-on training sessions prior to spring break to prepare to work with children in a K-12 setting. Teams will meet on their own time to prepare, and to initiate contact with the schools and teachers they will be working with. If you have any further questions, please e-mail pipeline@uw.edu.